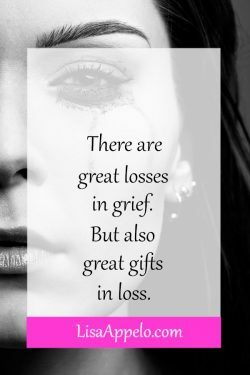 None of us get a pass from the secondary losses in grief. 1.Loss of co-parent – his energy to roughhouse with the boys, his help in the nighttime routine, the way you divided and conquered all the lessons and parent meetings and the way only he could disciple and discipline and love your children. 2. Loss of income – sometimes it’s the primary income right as you’re starting a family and the income you counted on to raise kids, pay bills and prepare for retirement years. 3. Loss of confidante – he knew you best. He knew how you tick, your passions, your fears, your tender spots and he was trustworthy in all of it. 4. Loss of youth – the day Dan died I felt like I aged a few decades. I went from mom of young kids to widow, the same age in years but decades older in life experience. 5. Loss of normal – every single part of life we were used to changed, from the boxes we checked on forms to the responsibilities we now had in the house. 6. Loss of routine – no kiss before he headed to work in the dark, no back door swinging open at the end of the day, no truck in the driveway, or mowing on the weekends, or driving us to church on Sunday. 7. Loss of traditions – the camping trip he took the kids on every summer, walking his daughters down the aisle, teaching his boys how to dress a deer or filet a fish or fix a leaking pipe. 8. Loss of couple friends – I am lucky. My friends have been incredible but there is the loss of going out as couples, having other families over and hanging out with old friends we grew up with. 9. Loss of anniversaries – man we worked hard at marriage. We’d married young and we looked forward to our 30th, 40th, 50th. Friends have passed us up and every celebration is a reminder of what we lost. 10. Loss of expected future – when Dan died, the future wasn’t just blank. It was a drop-off; a black hole I couldn’t begin to imagine. 11. Loss of identity – I loved being a wife. I miss being a wife. 12. Loss of shared past – I’d dated Dan since I was 16. I watched his brothers grow up and he watched mine. We’d been through high school, then college, then law school, first jobs, pregnancies, babies, surgeries, challenges, changes and so much together. The one who knows me best and experienced it with me is gone. 13. Loss of financial security – the loss of income, sometimes the sole income, creates a loss of financial security. 14. Loss of physical security – there’s often fear that comes from being home alone at night or traveling alone. 15. Loss of plans – every spoken and unspoken plan died with Dan from the next day’s agenda to next year’s vacation to next steps in our family. 16. Loss of children’s innocence – I watched my 6-year-old grow up overnight. I watched tween and teen boys do men’s work around the house. I watched my older two take on responsibility and worries they shouldn’t have carried and I have grieved their loss of innocence. 17. Loss for children – part of my grief has been grieving FOR my children. Grieving their incredible loss and not being able to fix their pain. 18. Loss of his friends – this is a natural part of the shift but I miss his friends and seeing him with his friends. 19. Loss of his colleague – here, too, I’ve been lucky because Dan worked with an amazing company that continues to include us in Christmas parties and reach out to our family in many ways. I miss hearing the day-to-day of what’s going on at his office, of how his company was growing and seeing all that his company accomplished. 20. Loss of his family – we have not lost Dan’s family but I hear from too many young widows that family relationships can become strained. 21. Loss of his dreams – oh, how I have grieved not seeing Dan walk out all the dreams he had. 22. Loss of his strengths – how I have missed the strengths he brought to our marriage, our family, parenting. The gap is so clear. 23. Loss of inside jokes – this may seem small but every time I start to say an inside joke or think of one we’d often trade, there’s a missing. We built a lifetime of things we got. 24. Loss of intimacy – marriage to your best friend is the best intimacy. 25. Loss of greatest emotional support. 26. Loss of biggest cheerleader. 27. Loss of home – we have not lost our home, but again, I know many widows who have gone through not only the excruciating pain of loss but the uprooting that comes from having to move. When we grieve with God and with HOPE, loss doesn’t get the last word. After making this list of secondary losses, I realized there’s another important list. An even more important list. Because while loss has been great, God has been greater. 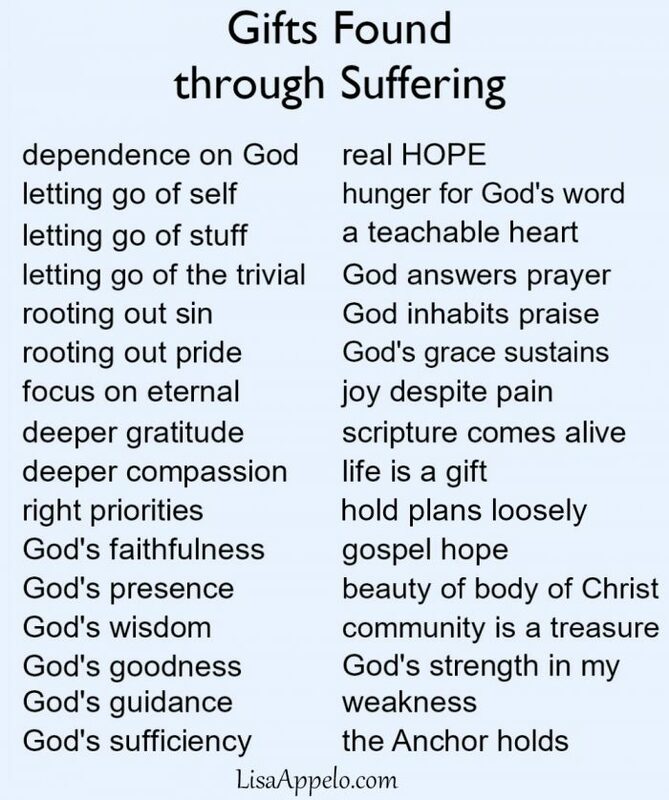 This is the list of the lessons learned in loss – gifts that have come through suffering. These are lessons in life that have come at a high cost, but lessons I’d never give back. They’ve reshaped me in the best way. 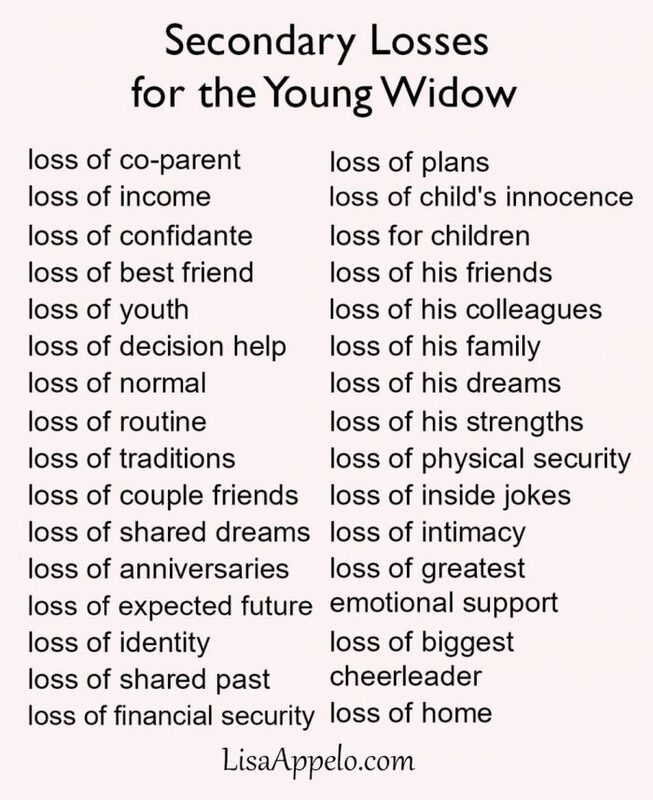 I’d encourage you, if you’re grieving, to make a list of your losses. Acknowledge them and realize the extent and depth of your loss. But then make that second list. Make a list of life lessons you’ve learned through grief. 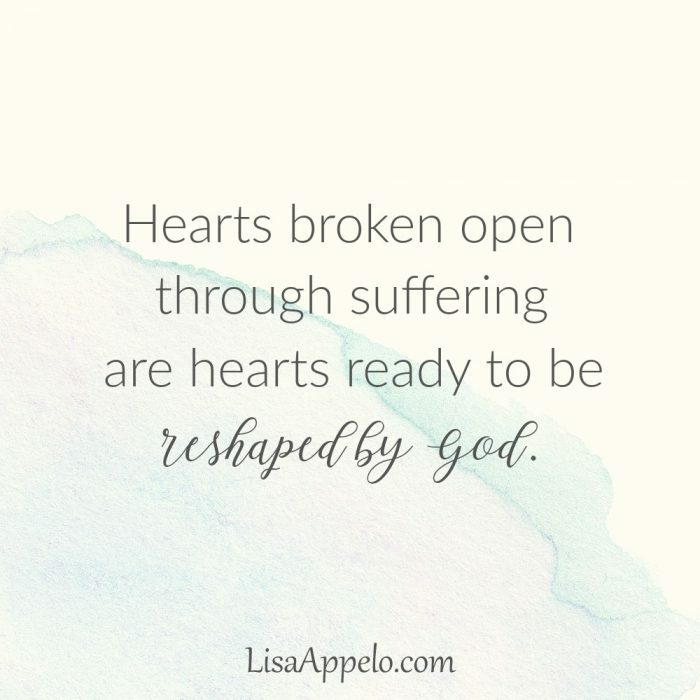 Because hearts broken open through suffering are hearts ready to be reshaped by God. If you’d like encouragement delivered right to your inbox, subscribe here and I’ll send you my FREE 100 Days with Christ reading plan and journal. How beautiful your message! We are muddling through the loss of my dad – 2 years ago this September – and being the support for my mom as she’s hit many of the “grieving walls”. They were HS sweethearts, married for 52 years when the big C hit. Mom was so focused on “getting him better” and “beating it”…and he did – only in God’s sense of healing. I was very close to my dad, being the eldest of three. And when dad went to be with Jesus, it was me and only me with him. It was peaceful and quick – I held his hand and sang In the Garden (his favorite hymn) – and watched the pain erase completely from his face. I felt it was such a gift – weird, huh? I’ve often wondered why I haven’t sobbed and sobbed with my grief – my pastor hubby says it’s my deep faith and knowing I’ll see him again. It’s different for sure, losing a parent versus a spouse, but I, too, can find all the blessings that my dad and heavenly father have showered over me. I loved your lists of loss and especially of the blessings. Now for a ha-ha – my maiden name is “Blessing”! Thanks for your blog posts and encouragement. I love them! Annette, what a great maiden name! What a loss….I’ve often wondered about the differences in a slow goodbye and a sudden death. Both are huge losses but you are right that death is a spiritual experience where we see them ushered into the presence of God. Thank you for sharing. Even though I’m an older widow and was blessed with almost 56 years of marriage, it is so difficult at this point and I share many of those secondary losses with you. I truly didn’t/don’t know any other way of life since I was married at 18 and I’m now 77. Three years later now and I’m still trying to find a way. I’m so thankful that I have God in my life, otherwise, I don’t think I could put one foot in front of the other. I wasn’t left with much financially after so many years of my husband’s illnesses and caregiving, but I’m still in much better shape than some and so thankful. I pray for you for all the changes and challenges you face and thank you for your words of wisdom. What a precious marriage, Linda, and such a deep loss. There are difference but so many similarities as we grieve our best friend and the one who knew you best. Praying for you now. This is so good! It’s both honest and hopeful. Bless you and your family. Thank you Sarah. The whole time I was making the first list, God was opening my eyes to the second. Forever grateful. Lisa, I am so blessed by the words God has allowed you to write. You nail it every time. It is 17 years this May and you speak so much truth! Hugs to you! 17 years! I’m sure in many ways it feels like yesteray and in others like the lifetime that has happened since. Hugs right back to you. Wow. I can’t imagine what you are going through and have been through. My Grandmother (now 99 1/2) lost her husband in an accident when she was only 36 years old and had a 2 month old baby and 2 teenagers (one my mother). She reared those kids all by herself, taught second grade for decades, and is still going. Her faithfulness has been an inspiration to all who have known her. Blessings to you and your family as you navigate this journey. These are the stories I cling to, Laura! To see women who’ve walked this road so bravely and have watched their children flourish despite such loss. Thank you for sharing! It’s been almost 6 months since Harley went to be with our Lord. I thank the Lord everyday for our 56 years together….but know I will see him again, n with the Lord walking by my side, n all the prayers being said for me helps greatly. I do miss him so. Six months is so new…so much raw grief as you try to adjust. Prayer is so helpful and praying friends are the best. This message was exactly what I needed, as I am working through 3 different grieving processes. It has put everything into perspective and made me realize how fragile life is and blessed I am to have the people in my life that I do — regardless of the struggle. First, my husband, who is also named Dan; my mom; and my 3 children and dog. Thank you for your courage, bravery, strength, and openness. Thank you for making me see things in a different light, things that I’ve been blinded to for some time. I deeply appreciate it. May God richly bless you and your family each and every day. Susan, I’m so glad this helped. There are no shortcuts to processing grief. Much grace to you as you absorb it and look to God’s comfort through it. Loss of memories is a loss that hits me hard. Memories of our kids’ childhood when everyone was itty bitty. What I couldn’t remember he would. Now it’s only me, and if I can’t remember the memory is gone. Yes! This is another one of those we bump up against and miss. Finishing each other’s stories and completing each other’s memories. Hugs to you, Cecilia. Forty years ago today I was widowed. Amazes me that sometimes it still seems like yesterday. These two lists are excellent and so very honest and true. Hugs.